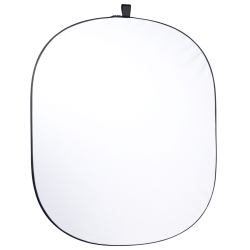 The Foldable Reflector is the ideal assistant for studio and outdoor photography. 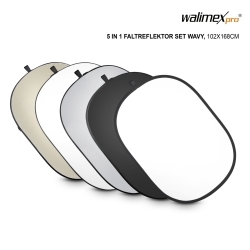 It can be used in portrait and landscape format and can also be hanged up through the three lateral mounted straps on e.g. tripods. 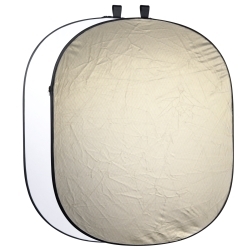 The white side of the reflector helps you to brighten up shadows, the wavy/gold side provides sunny, warm colours. Both sides also serve as brightener against unintentional shadows. You can therewith regulate the illumination of your motif very well. Thereby, the stretcher frame provides the required stability. 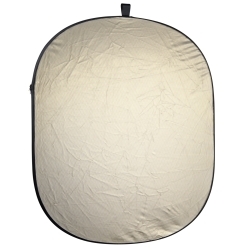 It bounces up on its own and can be folded and stored in the carrying bag within seconds.